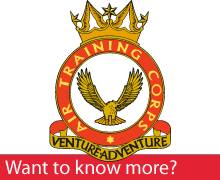 The most common volunteer designation in Air Cadets is Civilian Instructor - it's a varied role allowing you to use your skills where they best fit. You can give as much or little time as you can, and you don't need any formal qualifications - just enthusiasm that's infectious. Many cadets go straight into volunteer roles when they leave at 20 years old - often they feel that they can 'give back' their great experiences to a new generation of young people. Your role is vital to the success of our cadets. You'll see your dedication and effort pay-off in the achievements you inspire amongst our members. But it isn't just the cadets that benefit - you'll get involved in many squadron activities and have the same kinds of opportunities as cadets to develop your leadership skills and gain qualifications in things such as mountain leadership, First Aid and NVQs that may be useful to you in your career. You'll also have as much fun as the cadets do! Really show your skills in these areas and you could end up taking on more responsibility and moving up through the ranks as an officer or senior non-commissioned officer (SNCO). Of course, first you have to join as a Civilian Instructor and then have selection interviews but we guide you through that…if you have the potential then we’ll spot it!